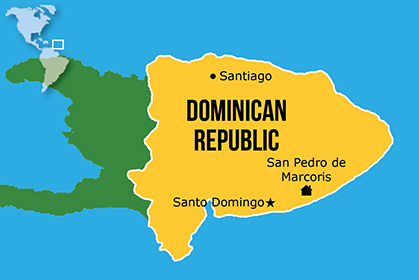 Our family in the Dominican Republic began with seven children in a rented home in the town of San Pedro de Macoris and quickly expanded to six rented houses. The bishop of San Pedro de Macoris, Francisco Ozoria Acosta, donated land to NPH on behalf of his diocese. Two adjacent parcels were then purchased and construction began on the NPH home. In September 2005, the family moved into their new home, naming it Casa Santa Ana. Casa Santa Ana has small family-style homes, each with its own kitchen and garden. The baseball field was built and improved by Lindos Sueños, a community outreach program of the Boston Red Sox. A Montessori program was launched in 2016. While not part of the national curriculum, NPH decided to add it in order to provide the highest quality of education possible. A special education program was also launched. The vocational school, which opened in September 2016, has 77 students, including 40 from the community. It offers technical careers in cabinetmaking, handicrafts, shoemaking, sewing, clay, and music. A Saturday morning workshop began in 2018. Activities include technical lessons such as woodworking and electricity, and creative learning with dance, music and painting. The goal is to help the children find an interest in an area of study and prepare them to work outside the home. Community outreach activities include construction projects, and medical, education, and social work programs/activities. A transitional home in Monte Plata was opened in 2017 to transition children into the main NPH home, reunite them with their families, or be placed in the care of a different home. A second home was opened in 2018, and services were expanded.